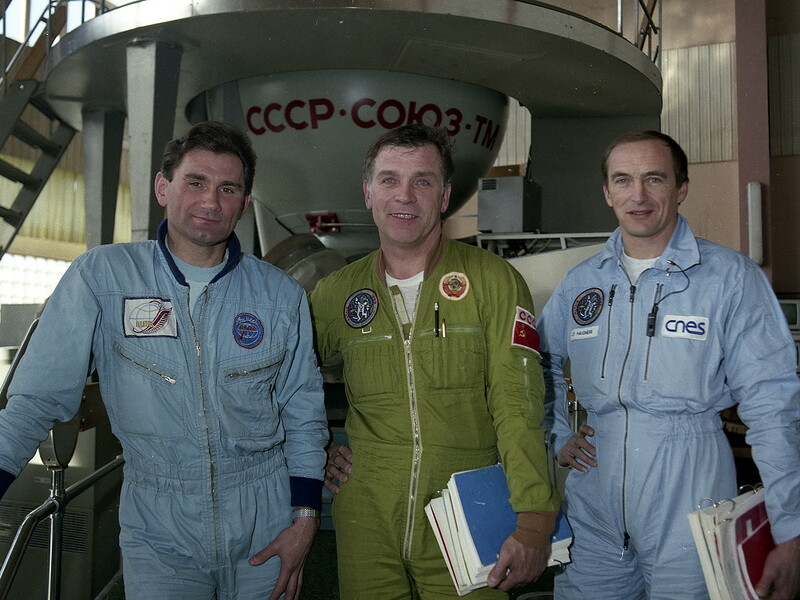 Aleksandr Serebrov (center), flanked by Vasili Tsibliyev (left) and Jean-Pierre Haigneré, during Soyuz TM-17 training. It was Serebrov’s fourth and final space mission (Credits: Joachim Becker/SpaceFacts.de). 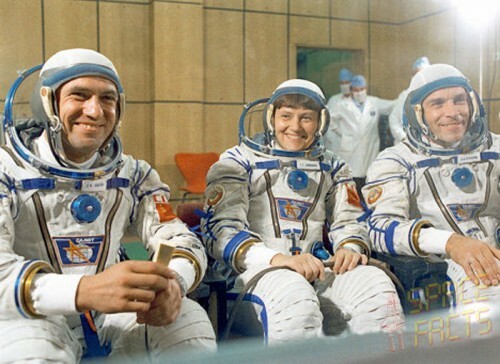 Aleksandr Serebrov (right), with Leonid Popov and Svetlana Savitskaya, ahead of their Soyuz T-7 mission in August 1982 (Credits: Joachim Becker/SpaceFacts.de). 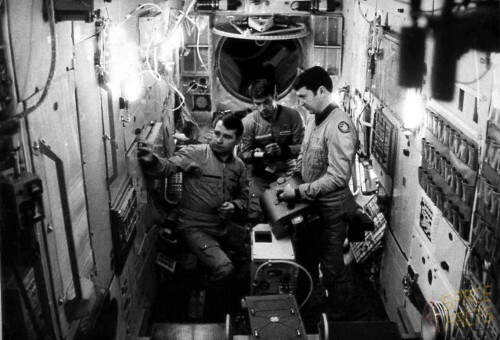 Space historian Phillip Clark suggested that a mission of between eight and nine months was anticipated by many Western observers, although when the cosmonauts rose from Earth on 20 April 1983, their launch occurred during a Salyut landing window. To Clark, this implied “that possibly a mission of four, six or even eight months had been planned,” but he cautioned that there were “comments made at the time … that this was notexpected to be a record-breaking mission … and therefore a four-month mission seems to be likely.” More recently, Hall and Shayler broadly concluded along the same lines, noting that a landing in the summer of 1983, perhaps July, was likely. It was decided to continue the rendezvous profile, whilst mission managers analyzed the problem, but the mood aboard Soyuz T-8 was tense. “To tell you honestly,” Titov said later, “we did not feel like rejoicing, so we just got down to work, calmly and busily, as we had trained to do.” By their sixth orbit it was time to rest, although none of the crew were psychologically or physically in any position to do so. The specter of a failed mission loomed large, for without Igla it would be impossible for the cosmonauts to navigate the final distance to Salyut 7, lacking the necessary ranging and closure data for either an automatic or manual docking. On the ground, controllers seemed more concerned about concealing the problem, but the station drew nearer with every passing hour andsomething would have to be done. Early on 21 April, Titov was told to attempt a manual docking, using visual cues alone, although ground simulations had already shown that the chances of success were slim. The Soyuz T-8 crew practice their duties aboard the Salyut 7 space station trainer (Credits: Joachim Becker/SpaceFacts.de). Perhaps Aleksandr Serebrov’s claim to fame is that he was first to trial the Soviet Union’s answer to NASA’s Manned Maneuvering Unit (MMU) … a jet-propelled backpack used only a handful of times in 1990 (Credits: Joachim Becker/SpaceFacts.de). 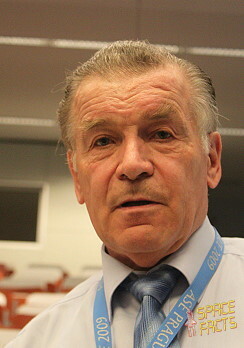 Serebrov in later life (Credits: Joachim Becker/SpaceFacts.de). August was a relatively quiet month, although the Perseids meteor shower produced a spectacular display for them. In readiness for a possible emergency return to Earth, Russian aircraft and rescue forces were placed on alert, and Tsibliyev and Serebrov watched, around-the-clock, from Mir’s windows as a total of 240 meteoroids burned up in the atmosphere. Several impacts were observed on the space station’s windows, creating pit-like craters, and particle fluxes were 2,000 times higher than normal. Tsibliyev referred to them as “battle wounds” and noted that they had caused minor damage to solar panels on the base block and Kristall. Although Mir sustained no obvious structural damage, it was decided to stage an EVA in September to inspect the exterior.The two cosmonauts spent more than four hours outside on 16 September, followed by another three hours on the 20th, primarily to assemble a cylindrical girder, extendible to some 16 feet (5 meters), atop the Kvant-1 module, which had design implications for Russia’s planned Mir-2 station. Then, on 28 September, they carried out a two-hour inspection, known as “Panorama,” in which a small hole was spotted in one of Mir’s solar arrays. The damaged area was surrounded by cracks, but the cosmonauts were unable to determine if a Perseid strike was responsible. 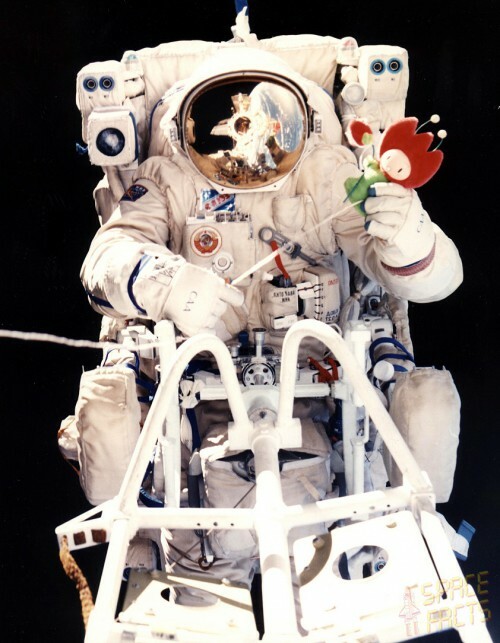 This EVA was scheduled for four hours, but ended earlier than planned when a cooling issue was experienced with Tsibliyev’s suit; he was forced to remain close to the Kvant-2 airlock, whilst Serebrov completed the photography of Mir and collected detector plates from a NASA-provided exposure experiment.